Originally a 3rd round (96th pick overall) draft choice by the Giants in 2006. 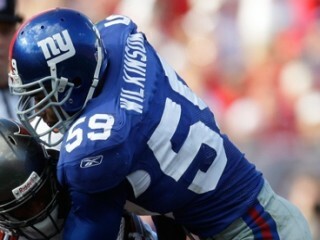 Wilkinson and Barry Cofield were the only Giants rookies to play in all 16 regular season games in 2006. Has played in 36 regular season games with 7 starts and in 4 postseason games with 1 start…Career stats include 32 tackles (21 solo), 2 passes defensed and 2 forced fumbles along with 28 special teams tackles. In 2009, played in 9 games…Dislocated his wrist vs. San Diego (11/8) and missed the final 7 games after being placed on injured reserve…Finished 3rd on the team with 12 special teams tackles (7 solo)…Also had 1 defensive tackle (vs. Oakland, 10/11). In 2008, played in 8 regular season games with 5 starts before injuring a knee that caused him to sit out the remainder of the season…Finished with 11 tackles (4 solo) and 2 special teams tackles. Started at weakside linebacker in the season opener vs. Washington (9/4) and finished with 4 tackles…Recorded 2 tackles at Cleveland (10/13) before leaving the game in the 2nd quarter with a knee injury…Inactive for 6 games before returning to action at Washington (11/30), where had 2 special teams tackles…Suffered knee sprain on opening kickoff at Dallas (12/14) and was inactive for the rest of the season. In 2007, played in 13 regular season games with no starts and in 4 postseason games with 1 start…Finished the regular season with 5 tackles (3 solo), 1 pass defensed and 7 special teams tackles. Started the NFC Wild Card Game at Tampa Bay (1/6) at weakside linebacker in place of the injured Kawika Mitchell and contributed 8 tackles (4 solo)…Had a special teams tackle vs. New England in Super Bowl XLII (2/3). Early action came on special teams before replacing Carlos Emmons at weakside linebacker when he left the game due to injury in the 4th quarter at Seattle (9/24)…Finished with 4 solo tackles and 1 special teams tackle…Stopped Maurice Morris for no gain and a 2-yard loss on consecutive plays in the 4th quarter. Made 1st career start vs. Houston (11/5) and contributed 3 tackles and a forced fumble…His 4th quarter hit on Jameel Cook forced a fumble that was recovered by Corey Webster and ended the Texans' final drive. Started vs. Chicago (11/12) and finished with 6 tackles (5 solo)…Tackled Thomas Jones for a 2-yard loss in the 1st quarter. Played in 50 games with 37 starts for the Yellow Jackets…Recorded 253 tackles (121 solo) and finished 14th on the school's career list with 12.5 sacks for minus 83 yards. His 38 stops for losses of 141 yards rank 7th on the school's record list. He was credited with 4 quarterback pressures, a forced fumble and 2 fumble recoveries. He also deflected 6 passes and gained 46 yards on 3 interception returns. Two-time team captain led the squad in tackles his last 2 years. The 2-time All-Atlantic Coast Conference selection began his career as an outside linebacker before starting his final 2 seasons at middle linebacker. As a strongside defensive end in 2003, he earned Academic All-ACC honors while starting every game. He collected 47 tackles (24 solo) with 4 sacks, 12 stops for losses and 3 pressures. Wilkinson also recovered 2 fumbles and batted away a pair of passes. In 2005, Wilkinson became only the 3rd player in the last 15 years to lead the team in tackles in back-to-back seasons. The 2nd-team All-ACC pick amassed 85 tackles (42 solo) and had 4 sacks with 9 stops for losses. He also intercepted 2 passes and deflected 2 others. Is a strong supporter of CancerCare, a national nonprofit organization that provides free professional support services to anyone affected by cancer: people with cancer, caregivers, children, loved ones, and the bereaved. CancerCare programs – including counseling, education, financial assistance and practical help – are provided by trained oncology social workers and are completely free of charge. Gerris attends their annual Festival of Hope fundraiser gala, and also attended their Healing Hearts Camp Weekend for children who have lost a loved on to cancer. Gerris lost his mother to cancer during his senior year in college. Attended Big Brothers & Big Sisters of NYC's Sidewalks of NY fundraiser. Attended the Champions for Children fundraiser gala benefitting the Tom Coughlin Jay Fund Foundation. Attended the annual Meet the Giants fundraiser benefitting the Ronald McDonald House of New York City, a home away from home for kids fighting cancer and blood disorders. Attended a fundraiser dinner hosted by Coach Peter Giunta for Holy Spirit School. Attended fundraiser dinner for Rising Stars, a non-profit organization that promotes education. Attended the Giants Kickoff Luncheon benefitting St. Vincent's Medical Center. Attended Skyline (Oakland, Calif.) High School, where he was a Super Prep 1st-team All-America selection as a senior…Earned 2nd-team All-State and 1s-team All-City and All-East Bay honors in his final season…Chosen to play in the Cal-Florida Bowl. As a senior, Wilkinson made 127 tackles with 6 sacks, 4 forced fumbles and 3 fumble recoveries…Contributed 85 tackles and 8 sacks as a junior. Earned his degree in Management on May 7, 2005, then played his final season while working on a 2nd degree in International Affairs. Son of Greggory Wilkinson, an Atlanta firefighter, and the late Denise Bowers. Born Gerris Vernard Bowers Wilkinson on April 5, 1983. View the full website biography of Gerris Wilkinson.